New subscription pack allows Sky Q customers to access Netflix content. Sky and Netflix have partnered to create the UK's largest on-demand TV service as part of a new premium subscription pack. 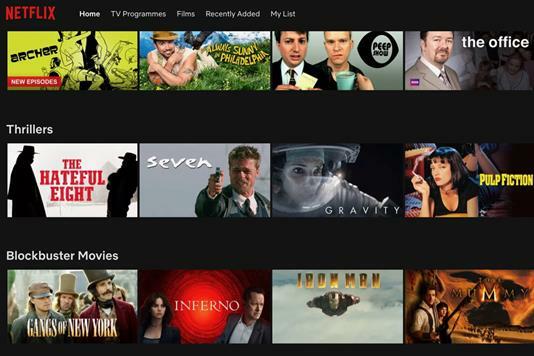 Netflix shows and films will be made available from November to subscribers of the premium Sky Q package. Sky Q customers will need to pay £10 a month for Netflix as an add-on called Ultimate on Demand, which is available as a 31-day rolling contract. Recommendations for both Sky and Netflix shows will be displayed on Sky Q’s homepage and content from both will be available to customers via Sky Q’s search function. The deal means Sky Box Sets, which include 400 UK and US series, and the full Netflix service will be available for the first time in a single on-demand service. Sky UK and Ireland chief executive Stephen van Rooyen said: "We want Sky Q to be the number one destination for TV fans. Partnering with Netflix means we will have all the best TV in one great value pack, making it even easier for you to watch all of your favourite shows." The rapid growth of Netflix’s streaming service has been a source of concern for broadcasters such as Sky and, until now, they have held off from integrating Netflix into their on-demand offerings. The Sky and Netflix agreement comes during a rapidly changing media environment caused by partnerships and mergers and acquisitions. Disney is in the process of completing a deal to buy 21st Century Fox’s TV and film assets, which include a 39% stake in Sky, before Fox or Comcast succeeds in taking full control of Sky. Customers with a Sky Q entertainment subscription will get Netflix’s standard plan, which includes two HD streams. Subscribers to the Sky Q experience package will be be provided with Netflix’s premium plan, which features ultra-HD and four streams. Payment for the Ultimate on Demand pack will be added to customers’ monthly Sky bills, removing the need for separate payments for each service.